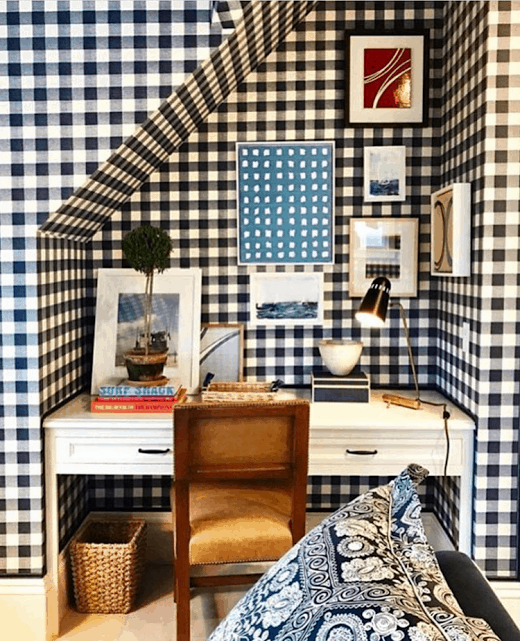 One of my latest decorating trend obsessions is buffalo check decor, especially in the colors of black and white. I’ve always had a thing for black and white decorating, but buffalo check takes it to a new level. What I love about this style is it’s perfect for both the holidays like Christmas, it’s a fun and crisp way to decorate in spring and summer too! Which is funny since I’ve never really liked plaid and it basically makes me think of the 80’s. 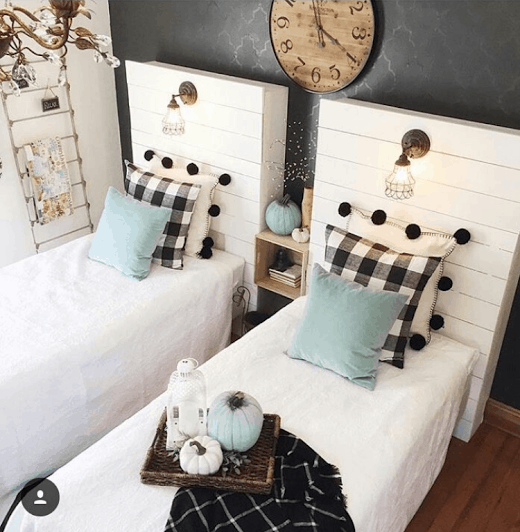 But, I was browsing on Instagram and came across black and white buffalo check home decor, which is so fun and really puts a modern twist on plaid. Hands down my favorite buffalo plaid colors are black and white, but navy and white or red and white are very pretty too. 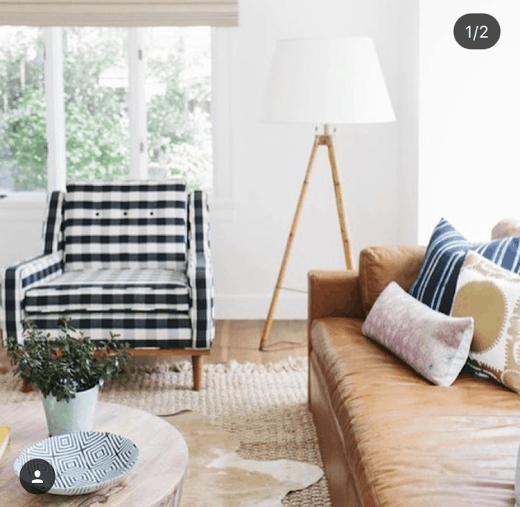 Instagram really inspired me to think past just buying or making buffalo check pillow covers and I found super fun ideas for furniture, table decorations, holiday decor, flooring, and of course many stylish pillow ideas. My personal favorite is the flooring idea through Better Homes & Gardens featuring the amazing DIY skills by Becky from the home decor & DIY blog, The Other Side of Neutral. Who knows, maybe when I finish my guest bathroom remodel, I’ll go with the black and white plaid flooring! ✅ This is the most popular buffalo check reader favorite! And by chance you were wondering (because I certainly was! ), where did buffalo check even come from? The buffalo check pattern originated in the 1700’s in Scotland and is a simple pattern associated with the MacGregor Clan, according to the Scottish Tartans Authority. It wasn’t manufactured in the U.S. until Woolrich produced the first ever Buffalo Check Wool Shirt in 1850. When many people today think of buffalo check, they think of Woolrich and that famous red and back wool shirt. 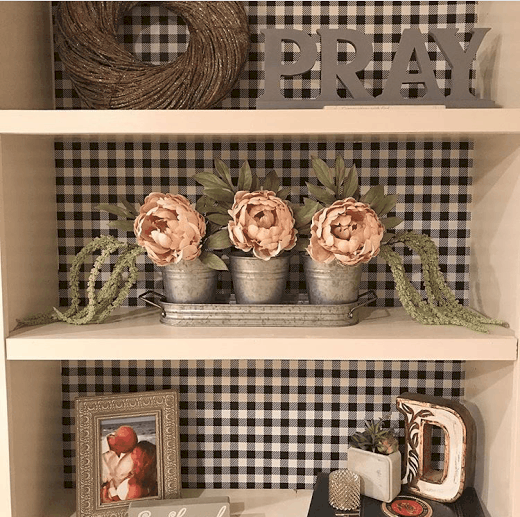 Again, while I have nothing against plaid clothing at all, I’m absolutely in love with the decorating options in this post and it’s really inspired me in my own home. I also love that it blends perfectly with either fall or winter decor. 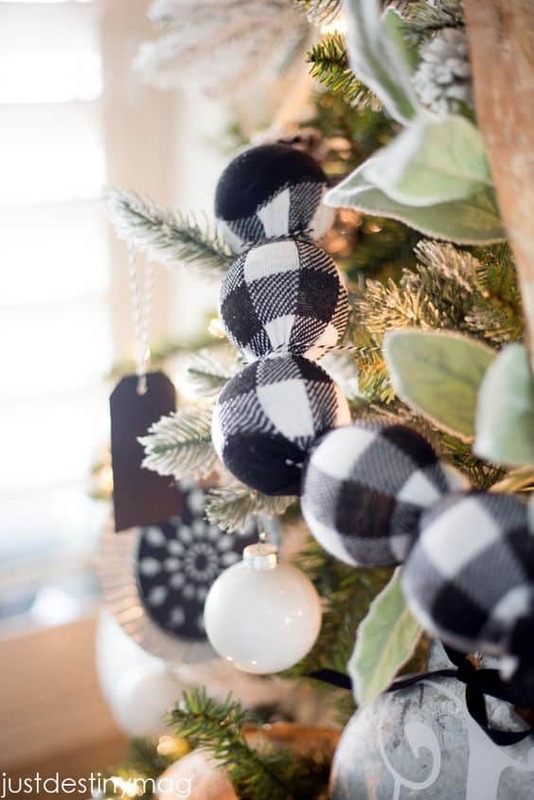 Here’s our favorite 20+ black and white buffalo check decorating ideas to hopefully inspire you all year long! Enjoy! Buffalo check pillows are the perfect and inexpensive way to go with adding a little bit of black and white buffalo check to your life. They’re also a wonderful staple decor item that works well with your seasonal decor too! Depending what you pair your buffalo check pillows with, can totally change the vibe of your space. Regardless of your decorating style, buffalo check lends an air of homey comfort. If you’re like me and constantly like to change your furniture pillows but don’t have tons of storage space, this is when buffalo check pillow covers are perfect! If you need inexpensive and highly rated pillow inserts, these are a terrific option. Home accessories in popular styles is a great way to enjoy the trendy styles or swap your accents out seasonally, without breaking the bank. 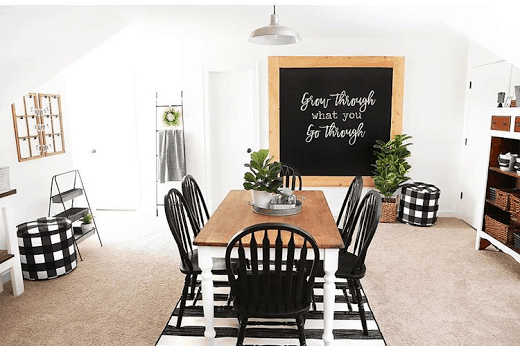 Becky from The Other Side of Neutral shares a black and white buffalo check painted floor tutorial on her blog if you’d prefer the DIY route. This stunning floor was also featured in the November 2017 issue of Better Homes & Gardens magazine! 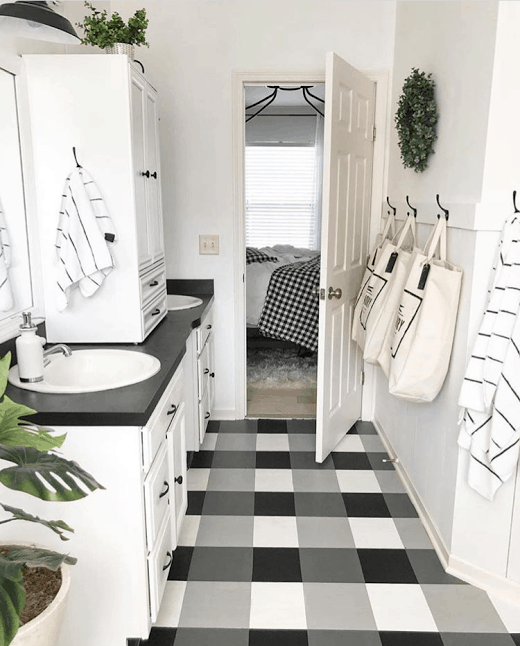 If you’d prefer to buy something ready to go, while this isn’t exactly buffalo check, black and white peel and stick flooring an inexpensive and easy alternative! What I love about the peel and stick flooring is it’s great if you just want an inexpensive trendy look that doesn’t commit you for many years. It’s also the ideal flooring for a rental house, apartment or RV. 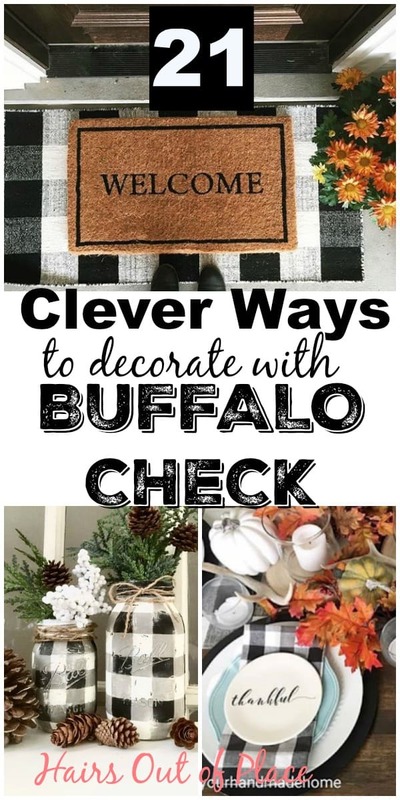 What I love about buffalo check decor is how versatile it is all year round. Black and white buffalo check gives your home cozy rustic charm every month of the year, but it especially shines in the fall and winter. 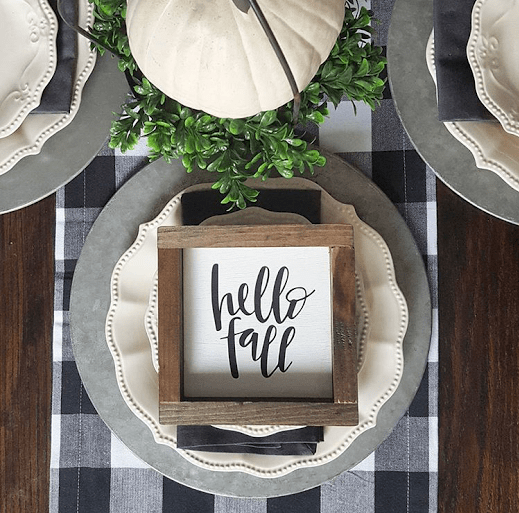 Whether you decorate with black and white buffalo stuffed pumpkins, pillow covers, or cute throw rugs, the black and white plaid contrasts beautifully with traditional fall colors. 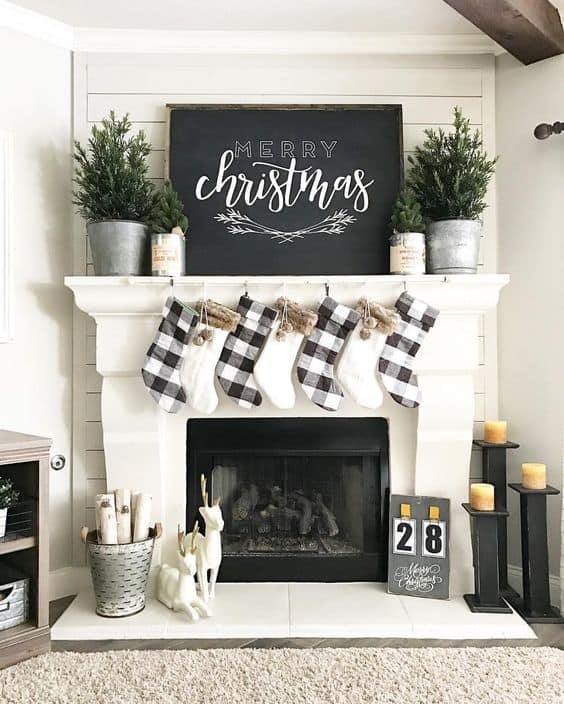 Black and white buffalo check fall decor basics like rugs, simple pillows, curtains and kitchen accents work like a charm with transitioning your home from fall into Christmas. 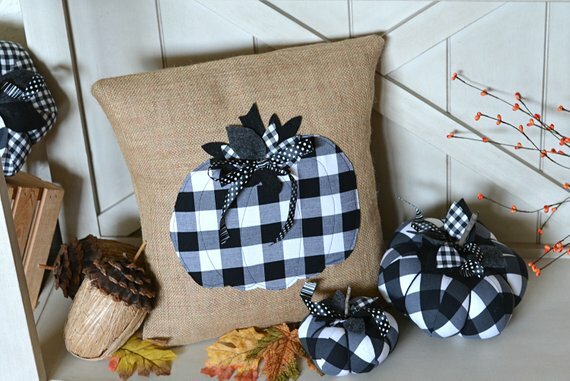 The simple square black and white buffalo check pillows are so adorable, why not quick it up a notch with cute as can be seasonal pumpkin buffalo check and burlap pillow covers? You can find these adorable handmade pillow covers here by Sherri Sew Sweet. She makes the cute handmade pumpkins in the photos too! If you need inexpensive and high-quality pillow inserts, these are a great choice. Adding a cozy farmhouse touch is perfect any time of year, but adds to the rustic vibe for the holidays. Whether it be a table runner, dishes, napkins, or accent pieces, you’ll definitely find a buffalo check table charming! Why not add festive and cozy buffalo check dishes to your holiday table? 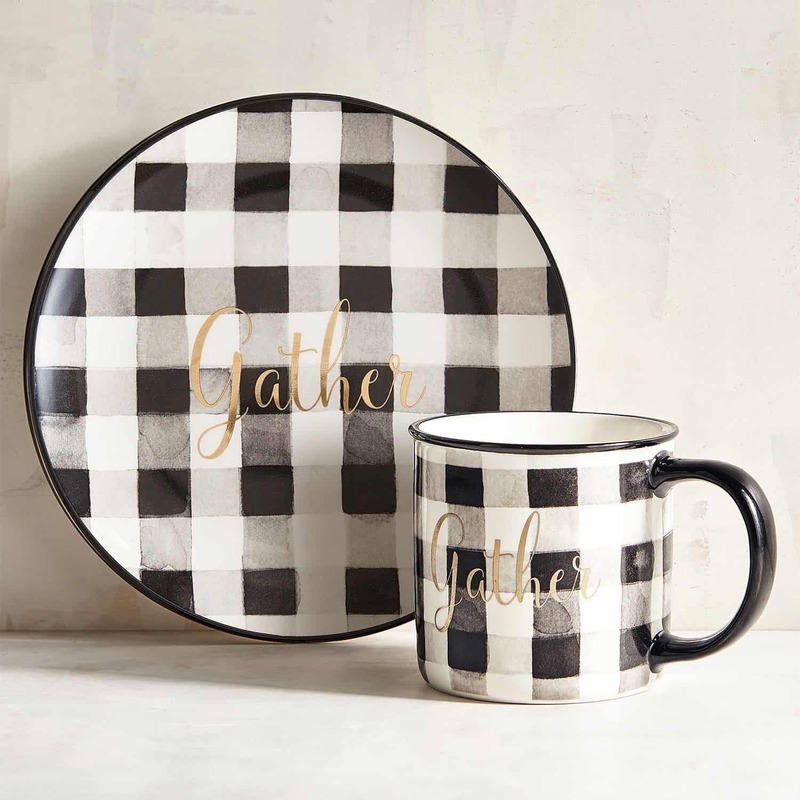 The Gather plates and mugs are simply adorable and such a bargain! Or use your everyday dishes and go for the layered look like Kailleasinkyle did. 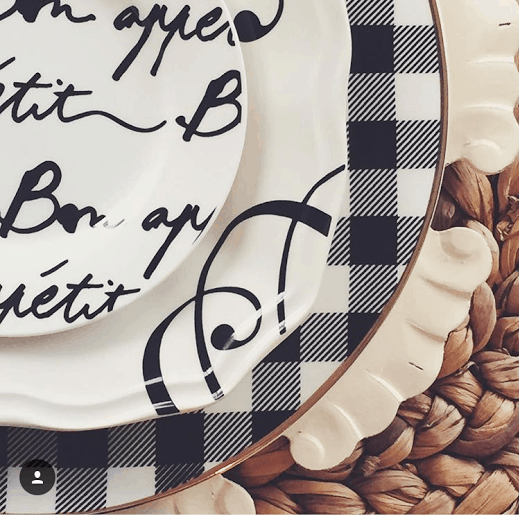 Amazon sells adorable black and white buffalo check disposable plates if you’d prefer to use them just for a single holiday occasion. Here’s some adorable ideas to inspire you for the holidays! 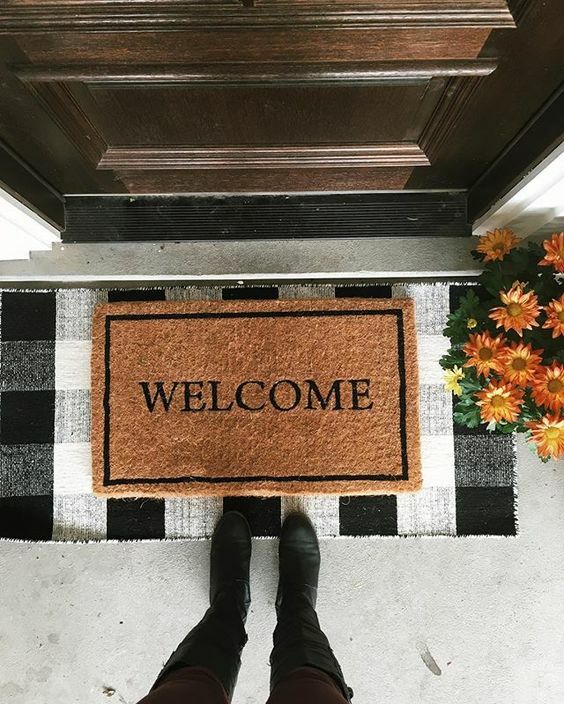 Whether it be easy and inexpensive accent pieces, handmade pieces by talented Etsy sellers or popular items from your favorite stores, black and white buffalo check is everywhere! 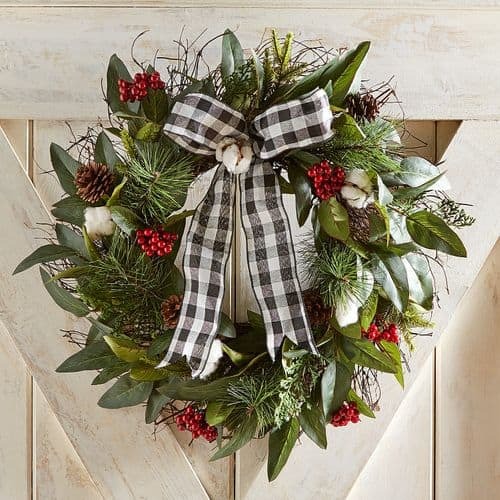 I adore this faux buffalo check wreath from Pier 1! 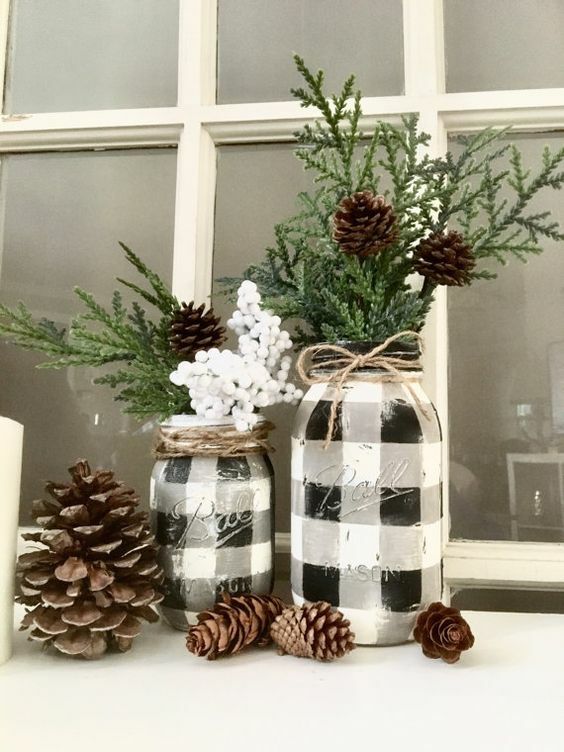 The Etsy seller Rustic Lola paints these black and white buffalo check mason jars, to be honest, they sell out like hot cakes! Be sure to check out her Etsy shop for other cute buffalo check and buffalo plaid items. 12 DIY Rustic Christmas Nature Crafts That are so Easy! Hi there! 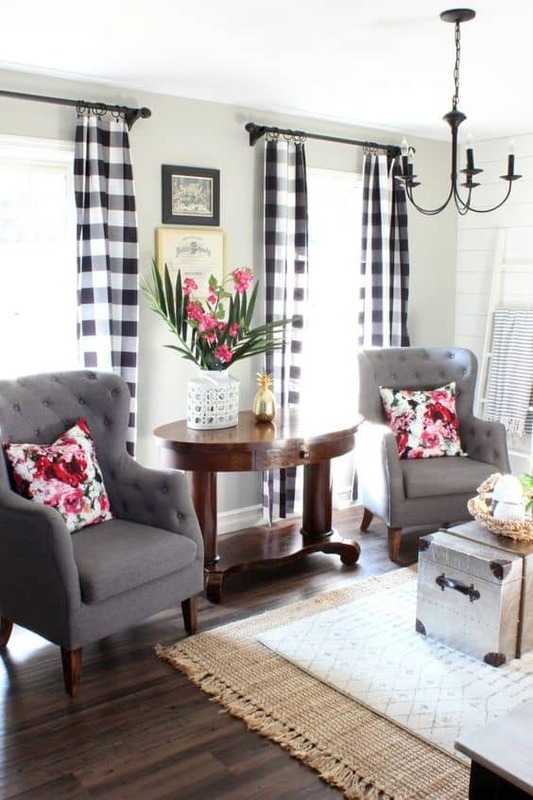 Love your round up of Buffalo Check, it’s been a fave of mine in decorating for years! Just wanted to say the Buffalo Check flooring that you found in Better Homes and Gardens is mine. ? I write the DIY blog, The Other Side of Neutral as well as my Instagram @theothersideofneutral. 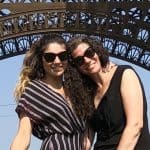 I’d love it if you would link my page in your awesome post! Thanks so much! Absolutely! I’m obsessed with your floor and am so impressed with your DIY skills! I just saw your instructions in the latest BH&G magazine earlier this week and it was on my to-do list to find the link to you directly. We’ve been renovating a beat-up 80’s rental house the past 5 years and am doing round-ups of my favorite things until I start doing posts about my own home. I just checked out your blog this morning and it’s given me so many great ideas! Congrats on your BH&G feature! These are all super cute and inspirational. Thanks for sharing! Where can you get the Buffalo Chex floors? Hi there! By far my favorite pattern too! Quick question, where did those white salad plates with the script “thankful” and “gather” come from? I’m dying for them. I am trying to find folks who might use buffalo check — with true vintage decor. I would love to see them combined. And what other patterns or colors can you combine with it BESIDES WHITE!!! 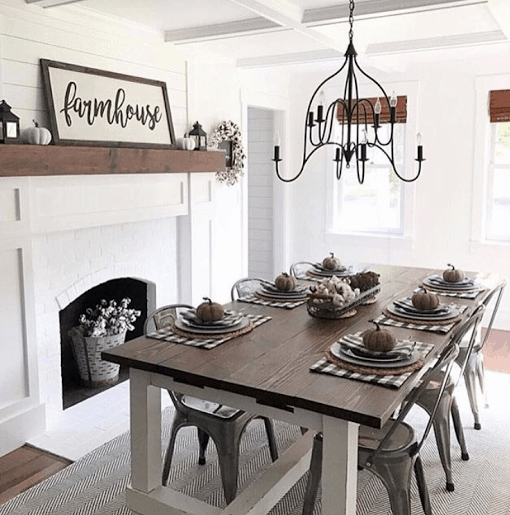 I am not a fan of the farmhouse movement. But there are elements of it I would like to borrow — if only I did not have to resort to white, white, everywhere. — especially the walls! How about Sage? Or another grayed-green? So sage, buffalo check, and ?? Red? Blue? Need that third color. Just meandering now. Trying to envision possibilities.